Fully PRA clear parents. I take this time to announce the safe arrival of our puppies born late August to our beautiful Nellie. she is a very soft and gentle natured 4 year old golden cocker spaniel. she is here to meet you with her brood. Puppys have been handled daily by all of us and are very happy and out going. they are just being weaned onto a complete puppy biscuit. You can not see the puppies personalities by the photos so please if you have done your research and its defiantly this breed you want to welcome into your home please call. Puppies are now looking for their new family and will leave our home fully wormed and Flea treated. weaned and drinking water. They will be vaccinated at 7 weeks of age. Both parents have had their DNA done and have both been proven clear. 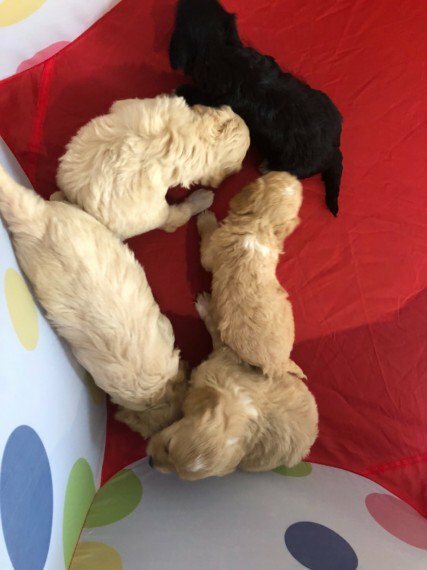 therefor the puppies will not carry or ever have Progressive Retinal Atrophy If yo feel you can welcome one of her puppys into your family home please call to arrange a visit to us.